UK Youth Parliament members from Devon are to take part in a national debate at the House Of Lords. The three representatives will join 300 other young people who have been elected from around the country. They will be taking over the main Lords' chamber to debate issues of particular importance to young people in their area. Items on the agenda include the abolition of university tuition fees and lowering the voting age to 16. They will also be discussing a public transport concession card for young people, environmental campaigning and the representation of young people in the media. The youth parliamentarians will then vote to decide the three most important issues, which will then become part of the UK Youth Parliament campaigns for 2008/9. Alex White, the member for North, West Devon and Torridge, said: "This is our opportunity to show everybody that we take politics seriously and want to have an active part in decisions that affect our lives. "I hope this is a sign of things to come and perhaps one day we will get the opportunity to sit in the House of Commons." The debate will take place on 2 May. 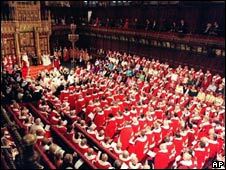 The UK Youth Parliament was set up in 1999 and elections are held every year. There are currently 500 MYPs (Members of the Youth Parliament). Any young person aged 11 to 18 can stand as a member or vote in Youth Parliament elections.